The Play: A Midsummer Night’s Dream. Directed by: Max Reinhardt, 1935. 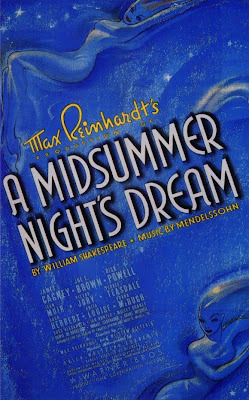 Genre & Setting: When I read MSND a few months ago, I pointed out that it was an pretty perfect specimen of a comedy, and also that it was often staged as a Big-Budget Spectacular. The Reinhardt production was a Big-, or at least a Medium-, Budget Spectacular of the 1930s, and has a touch of Busby Berkeley about it. It is decidedly in the genre of “old movie,” and in fact feels a bit older than its 77 years. The Gist, which will obviously involve spoilers: The 3½ threads that I discussed last time: Boy loves Girl who loves Other Boy who loves Other Girl; yokels want to put on a play; and the King of the Faeries tricks his wife into sleeping with a donkey – and everything is resolved sooner than expected, so that the yokels’ play can enliven the Duke’s wedding! The Adaptation: Apparently this project started as a large-scale live production at the Hollywood Bowl, and then Reinhardt and some of the production crew and actors worked on bringing it to the screen. This may aggravate something I’ve felt with most older attempts to film Shakespeare: directors clung to stage conventions that work beautifully in live performance, but come across as wooden on film. This lag is something evident in almost all early movies, but it seems to have hung on longer in attempts to film Shakespeare. It’s not hard to see why this would be the case: Shakespeare plays are plays, after all, and the core of the stage repertoire at that. In any event, this MSND struggles from start to finish to find cinematic visual effects that can make a good movie out of awkwardly stage-bound action. Reinhardt’s production also fights an internal war between its high-culture and mass-culture ambitions. 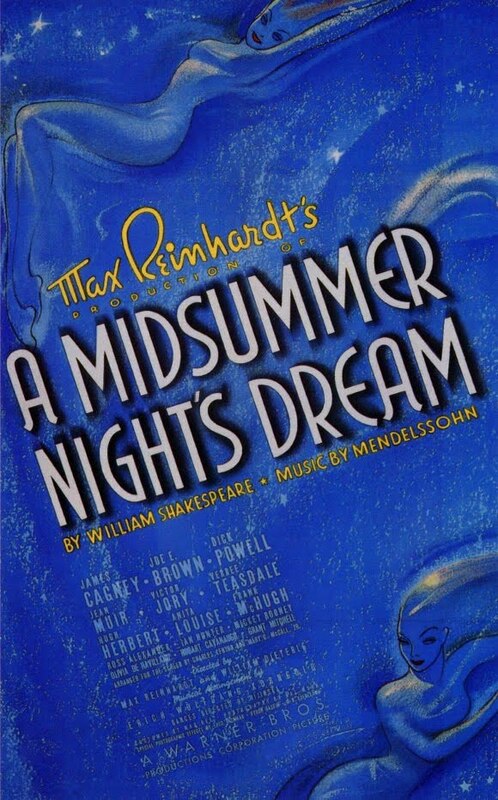 Shakespeare’s screenplay is followed quite faithfully, Felix Mendelssohn’s incidental music (beefed up by Erik Korngold) is deployed very prominently right down to the lengthy overture, and Bronislava Nijinska was commissioned to choreograph dance sequences for the fairies. On the other hand, top billing is given to tough guy James Cagney in a singular role as Bottom the Weaver – he does fine with it – and the lower register of Shakespeare’s spectrum of comedy is emphasized and augmented in what was probably a sincere attempt to make Shakespeare accessible and lucrative with the broadest possible audience. I imagine that the broad audience probably found this MSND’s intellectual ambitions pretty pompous and that pompous intellectuals found the broad humor fairly grinding. I am guilty on both counts. It is also, how to say it – twee? Too too? Sacherine? Simpering? – whenever the presence of fairies gives it the opportunity to pour on the dazzling magic. But then, that’s the period for you. The same spirit infuses all of the great animated Disney classics, for instance, none of which I can abide. But a lot of people like that kind of thing, or at least they seemed to have back in the day. Clocks In At: Well over two hours. Pros: Easy to follow. Anita Louise is charming as Titania. Cons: It’s a bad sign in a comedy when there are frequent shots of characters laughing heartily, because everything is so darn funny. A 15 year old Micky Rooney would be a very competent Puck if he hadn’t been instructed to make madcap chortlings after every line. After a while, you want to wring his goddamn neck. Notes: Subtlety of language was not a standout feature of this production, which may have to do with the director being a German refugee who was working through an interpreter. Still, two linguistic details struck me while I watched. One was an off-color line spoken by “Thisbe” to “The Wall” in the yokels’ play: “My cherry lips have often kissed thy stones.” That’s a pretty funny thing for a man to be forced by circumstances to say to one of his pals. Unfortunately, though predictably, it was one of the few lines in the play-within-a-play that the production didn’t try to milk for laughs. It’s an amusingly brazen cue for applause, but it also contrives (a bit laboriously) to end the play on an interesting word. “Amends” sounds an awful lot like another word that folks of Shakespeare’s time (and some folks today, of course) would be very accustomed to hearing at the end of extended public discourses. Its use here makes the play’s conclusion sound and feel especially final. I’ll further bet that it seemed sassy and edgy to wrap up an entertainment so full of pagan Fairyland trappings and just-offstage sexuality with a homonym of the pious word “Amen.” Always up to something, that Shakespeare. Prognosis: Unless you have a particular taste for films of this era, this is not a Shakespeare-adaptation must-see. A more positive assessment, focusing more on the old-movie aspect than the Shakespeare aspect, is here.